Using dynamic phrases based on real performances by top studio bass players in 30 styles, Virtual Bassist covers almost every conceivable music genre, delivering bass sounds and phrases for rock, pop, reggae, metal and hip hop to name just a few. Playing Virtual Bassist is just as easy as playing the keys on your MIDI keyboard: each style contains 2 octaves of phrases of varying complexity and fills. 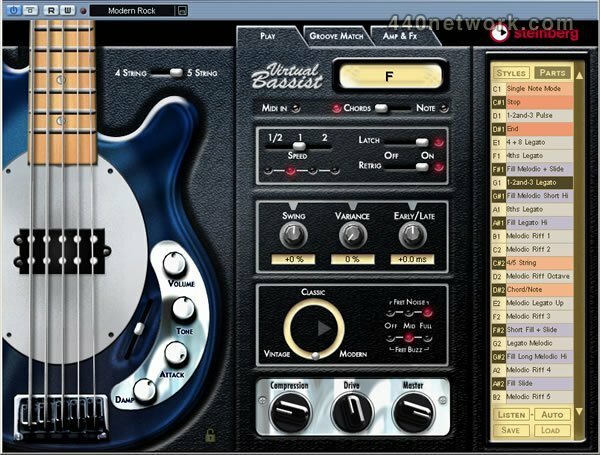 The innovative GrooveMatch Technology allows users to mould the Virtual Bassist bass line performance to existing drum grooves either by flexibly editing notes or shifting the overall groove of any phrase. 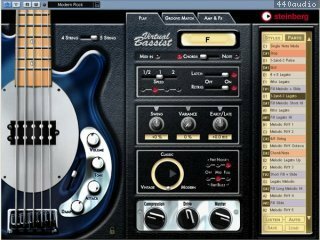 Virtual Bassist comes with a full range of sound-shaping features, including six high-quality virtual stomp box effects optimized for bass guitar, a choice of tube or solid state amp head, bass cabinets and microphones as well as mic positioning options to build ideal bass guitar parts. Mac OS X v10.4 Power Mac G4 1 GHz Minimum (PowerPC only) 512 MB RAM DVD drive required for installation CoreAudio compatible audio hardware is required Steinberg Key (copy protection device) and USB port required* Internet connection required for license activation For usage as plug-in, a VST (VST 2.3 or higher) or AU compatible host is required (AU hosting is compatible with Logic 7.1.1 or Digital Performer 4.6). For usage as Rewire slave device, a Rewire compatible host is required.